The Bank Reconciliation Detail Report allows for the viewing of cleared and uncleared transactions in detail. This reports shows, for that particular bank account, all deposits and other credits, all checks and payments made towards that account. Totals for AP, AR, PR, and GL will be shown by Number of Items and Uncleared and Cleared amounts. Cleared amounts that have yet to be posted are treated as uncleared by the system. This report will show transactions with beginning and ending balance information validated against your company’s bank reconciliation file. This can be very useful to view the activity and reconciliation detail information for a particular account. Select the Reconciliation Detail Report from the Reports window. Enter the cash account you would like to view. Pressing the F7 key will allow you to search for the Main Account by number or pressing the F8 key will allow you to search for the Account by description. Transactions marked as “cleared” in the Reconcile Bank Statement Process will show as a cleared amount in this report even if Y is specified. Cleared amounts are not seens as cleared by the system until the posting. 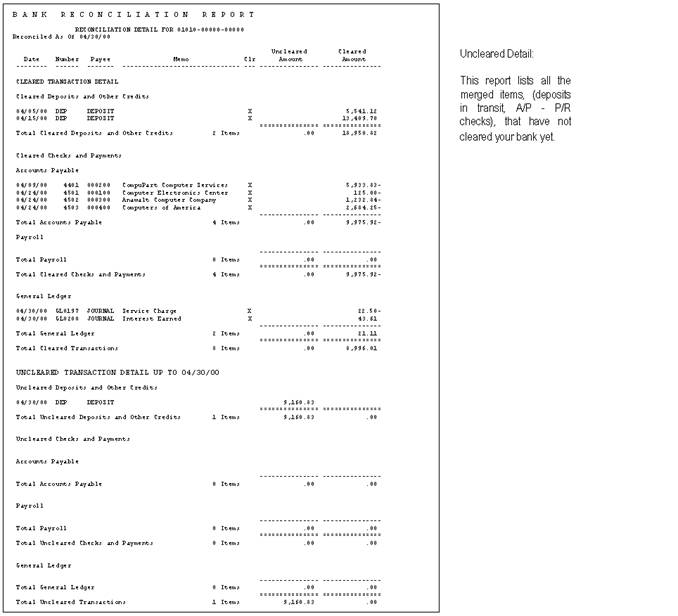 The Detail Report prints a detailed listing of the summary report but does not tie back to the G/L Ending Cash Balance. After you have completed reconciling your check register to your bank statement you will also be prompted if you would like to print this report.